Open heart surgery. 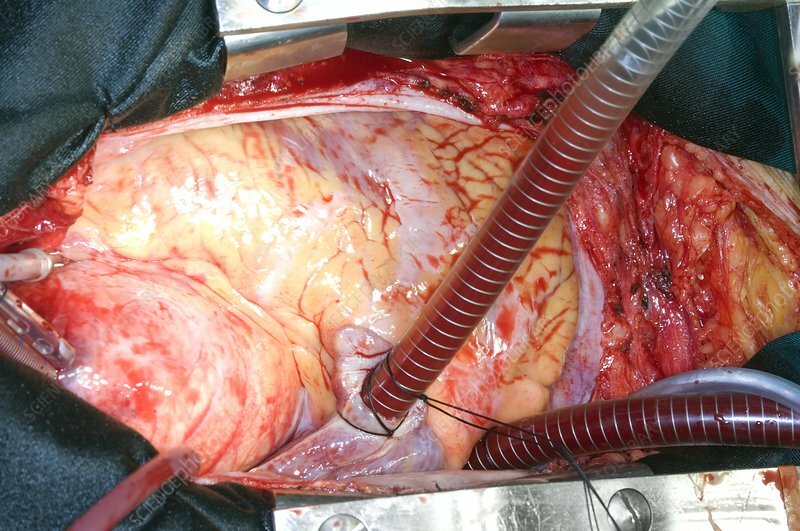 Tubes from a heart-lung machine attached to a heart during heart surgery. A heart-lung machine is used to maintain the body's vital functions while the heart is stopped temporarily during surgery. This surgery is being carried out to replace a bicuspid aortic heart valve (BAV) and part of the aorta (the body's main artery). The aorta has become dilated due to the BAV. BAV is a congenital defect of the aortic valve where it has two cusps (sealing flaps) rather than the usual three. This can disrupt the flow of blood from the heart to the aorta and reduce the strength of the descending aorta, leading to an increased risk of dilation or aneurysm.